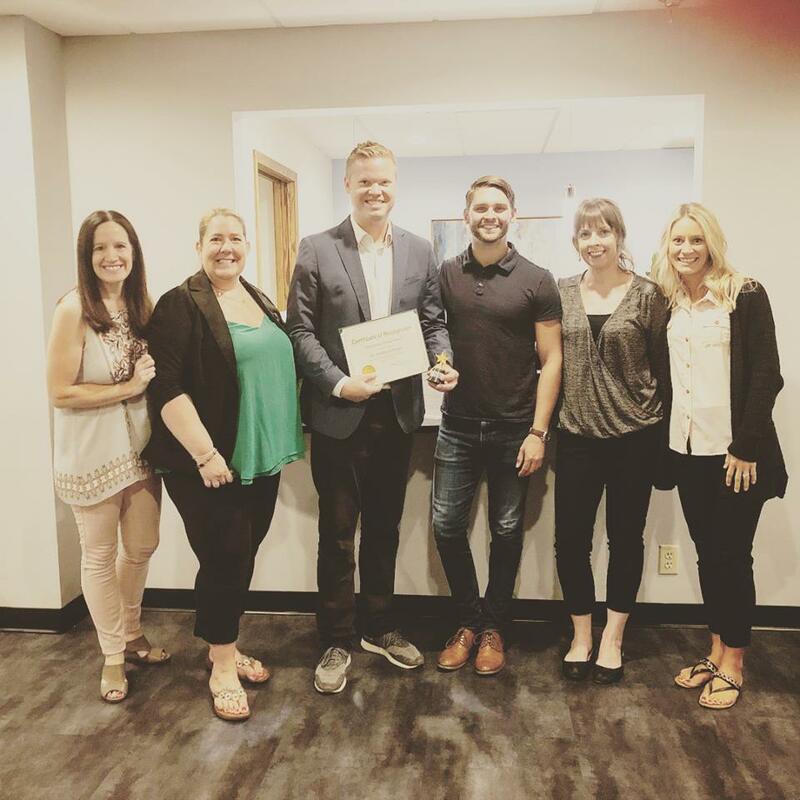 This week I gave away my very first “You Make A Difference” award to Dr. Jeremy Schmoe at Midwest Functional Neurology Center (MFNC) in Minnetonka, Minnesota. 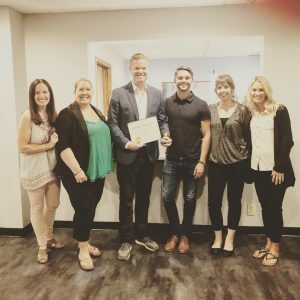 I presented him with an award for “Outstanding Provider” for his dedication to helping TBI survivors find relief from their lingering symptoms. I decided to create this award to recognize individuals across the country who are making a difference in the TBI community, including: providers, advocates, survivors, caregivers, and organizations! I knew that my very first award would be going to Dr. Schmoe, because without him I doubt I would be anywhere near the level of recovery that I am today! 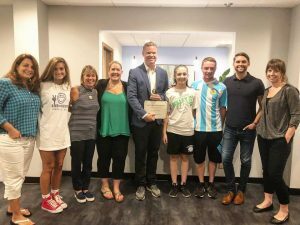 It is because of his vast knowledge of the vestibular, central nervous, and neurological systems as a Functional Neurologist that I was able to find relief from my lingering fatigue, dizziness, memory deficits, and eye disorders. No other doctor came anywhere near helping me with my symptoms, and I was often left feeling like I was making it all up and there were days I considered ending my own life. Some of Dr. Schmoe’s patients were on hand to see him receive his award! When Dr. Schmoe read one of my Huffington Post pieces he realized I was local to him and reached out to me — this was 2.5 years into my recovery. I blew him off for awhile because I didn’t believe anyone could help me at this point (after being told as much from numerous doctors before him). I finally decided I had nothing to lose and went in for a consultation/exam. I was blown away by his knowledge, and his sincere understanding of how I was feeling. The rest, as they say, is history! (read more about my experience HERE). So as a small token of my appreciate, I presented Dr. Schmoe with my inaugural “You Make A Difference” award!! Thank you, Jeremy, for all you have done for me and HUNDREDS of patients from across the globe! Dear Amy, Thank you for all your hard work. My accident was eight years ago, and I still have a lot of lingering difficulties. The information you have shared has been very enlightening in that you have covered and affirmed so many subtleties of this disability. I found my self saying yes, yes, to your various pieces, someone understands this. I am a young 68 years old. I was an attorney and had to retire early given my organizational and reading difficulties post TBI. One of the big problems I had was people trying to normalize my challenges by saying things like,” Oh that happens to me too” or “You know we’re all getting older.” I had to bite my tongue a lot or occasionally offer that yes, but, there was a big difference between being 60 and being 80, since this was the cognitive jump in age I felt I made. I might also sometimes say yes, I’m sure this happens to you too but not every 15 minutes? I did not want to be unkind to people who were, in their mind trying to help. so the situation was a little confusing . I also, began destructive face picking behavior which can go hand in hand with left brain frontal occipital damage and to also perhaps give some visual weight to my invisible injuries in trying to defeat the “Well you look ok comments.” I had to retire early from my practice of law once I realized I could do more harm than good at it. of sorts where one from out of state could come under reasonable economics camp out for a chunk of time to further aid their recovery? I am so glad you gave Dr. Schmoe the first “You Make a Difference” award! He has definitely made a difference in my son Brandon’s life. I can hardly wait until his next treatment with Dr. Schmoe. He is awesome!! I am so happy to hear Brandon will be back again, bummed I will miss you guys! !